Children 1-13 years: 1/2 tsp. (2.5ml) daily with meal. Children 14-18 years: 3/4 tsp. (3.75ml) daily with meal. Adults: 1 tsp. (5ml) daily with meal. Store in a cool, dark area. Molecularly distilled mackerel, sardines and anchovy oil, cold pressed thyme oil, natural cran-raspberry flavour. Neuromega is a powerful DHA liquid concentration which supports and maintains neurological activity, the eyes and the nervous system at all levels. Its therapeutic benefits are increasingly documented. DHA is the primary component of the brain tissue and the only essential fatty acid presents in the brain, hence its huge scope of activity. 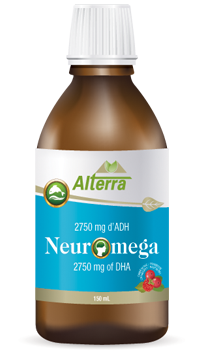 Neuromega would therefore help increase and improve neurological activity at levels of pathology not attainable without a very high dosage of DHA supplementation. The optimal concentration of this oil allows for those high dosages in one teaspoon only, thus eliminating the need for large quantities of oil intake, which, like any other oil can be difficult to absorb and digest. Elevated DHA also improves depression and prevents its reoccurrences. As the only essential fatty acid in the brain, DHA is an integral constituent of its cell tissue and its electric impulses. It is thus a key component in the proper functioning of neurons and synapses (links connections neurons). Furthermore, DHA is an important contributor of Glucose transfer to the brain and insufficient DHA would immediately reduce the organism's capacity to pump enough of this important substance (glucose is our brain fuel) to the brain.